Currently I am producing match ratings for English (including Conference) and Scottish leagues. The method I use is based mainly on articles found on clubelo.com. I say mainly as there are some differences. My ratings only take league games into account. FA cup, League cup, European matches and friendlies are not included. I also apply a static home advantage of 90 points for English games and 50 points for Scottish games. Match ratings for English and Scottish league games start with the 2000/2001 season. Match ratings are generated using Team Elo ratings therefore team Elo ratings where calculated a couple of seasons earlier than the match ratings starting with the 1998/1999 season. Each team in the four English and Four Scottish divisions are given 1,500 Elo points for the start of the 1998/1999 season. As the fixtures progress the changes in the team rating begins to reflect the strength of each team relative to the other teams in the division. Ratings for the Conference league started with the 2005/2006 season. At the end of each season an adjustment is made to deal with teams that are relegated and promoted. In order to keep the number of points in each division constant I have opted to simply reallocate the total points of the division’s relegated teams and assign them between the newly promoted teams and vice a versa. This may not be the best approach particularly when a division has only one promotion spot like the Scottish Premier. 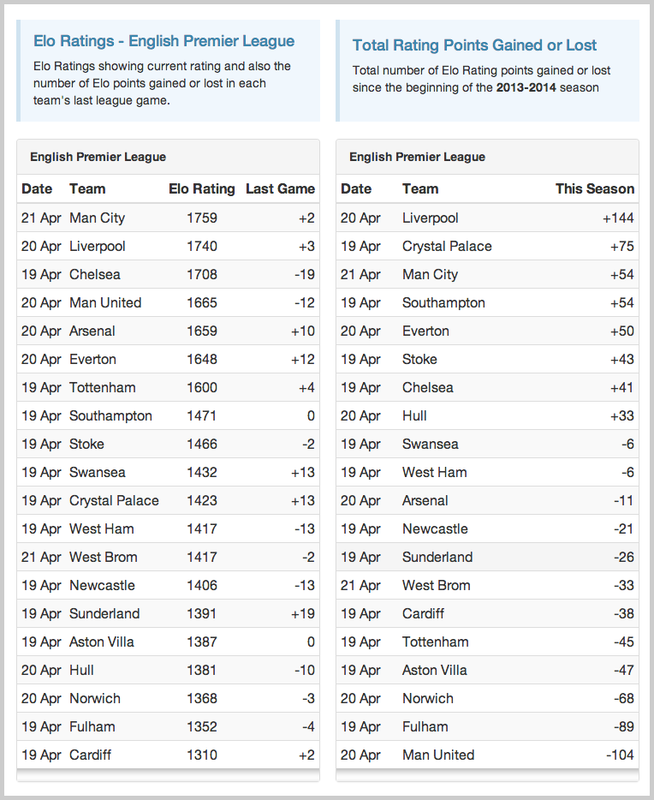 At some point I’ll look closer at how relegated and promoted teams perform in their following season. A team’s rating may increase or decrease or occasionally stay the same. Rating points are exchanged between the two sides. For example, if a home team’s rating is increased by 7 points then the away team’s rating is decreased by 7 points. A match rating for the next game is created by simply taking the home team’s Elo rating and subtracting the away teams’s Elo rating. A high positive number indicates that the home team is the stronger team and a high negative number indicates that the away team is stronger. My next task is to understand Bivariate Poisson Distribution to calculate probabilities and odds for match results and correct scores.